We review the best mini ovens on the UK market in 2018. What are mini ovens and why do you need one in your kitchen? Basically, mini ovens are just what’d you think – these wonderful inventions are miniature sized ovens. In essence, mini ovens are designed to do exactly the same thing like regular sized ovens, only with a small difference: they’re much smaller and take up significantly less space. What’s more, mini ovens are portable, making them ideal for people who want to cook their own food on vacations and trips. Of course, there’s a plethora of mini oven models and brands, so choosing the right one might not be as easy as you initially thought. Since we now know what mini ovens are, let’s see what benefits you could achieve by purchasing one before we move on to our reviews of the best mini ovens on the UK market. Mini ovens do the same thing as regular sized ovens, and it’s a fact that the difference in price between an average oven and mini oven isn’t too great, so what are the most notable benefits of owning a mini oven? Better yet, why should you even consider buying one? First of all, try picturing your kitchen without the oven: notice how the gap could be filled with all sorts of different things? You could easily widen your counter, get a dishwasher if you don’t own one already, or simply reorganize everything with a bit of extra space. That means that the first notable benefit of owning a mini oven is that they’re very practical. Furthermore, since mini ovens are so small, they are substantially easier to maintain and clean. We can all agree that we hate sliding behind our ovens to rub off the stains and dust, but you can kiss those ugly memories goodbye as soon as you start using a mini oven. Secondly, there are all kinds of mini ovens you can choose. There are extra small ones which are best suited for travel, specialty ones which come outfitted with several heating elements, and versatile models that are supplied with a huge arsenal of convenient features. Essentially, your budget will play the key role when determining which model is the best mini oven for you. There are numerous other factors tto consider, such as the spaciousness of your mini oven, how quickly it heats up, and how powerful it is. First of all, let’s discuss the pricing of mini ovens. Most quality ovens cost about £50 or more, so if you feel like this is too much for you, feel free to consider our top budget pick – Quest’s mini oven. This particular mini oven can’t compare with the rest of our picks in terms of performance and versatility, but it’s great for beginner chefs and cooks on a limited budget. Secondly, let’s talk a bit about the warm up process of mini ovens. Some models take their sweet time to get up and running, others are as fast as a microwave. Depending on how quickly you want your meals done (and your profession, for example if you’re a professional cook), choose accordingly. Lastly, the power of mini ovens is (the same goes for regular ovens) measured in watts. The higher the number, the more powerful the oven is – if you don’t intend to do any “heavy” cooking, less powerful ovens will do just fine, otherwise consider our top picks (or runner ups). Now, without further ado, let’s move on to our reviews of the best mini ovens on the UK market. We’re opening up our review of the best mini ovens with VonShef’s 36L mini oven. Basically, this is one of the most versatile ovens you’ll find on the market. 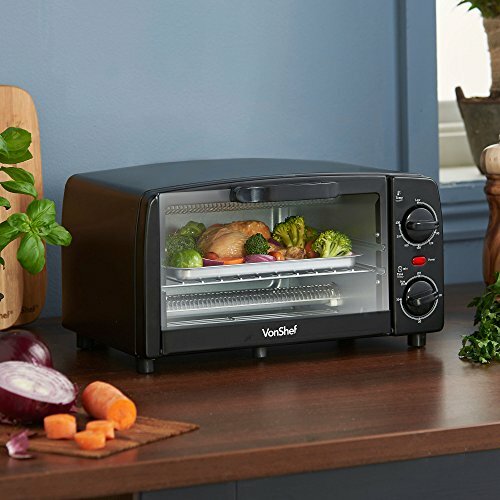 VonShef offers this mini oven in 9L and 36L options, although we’ve chosen the latter because it’s absolutely perfect for both casual and professional cooking. The reason why we label it as “superiorly versatile” is because it can grill, bake, boil, roast, broil, and toast your food with great ease. There’s a total of six cooking functions onboard, including a spit roast, sixty minute timer, as well as a temperature adjustment knob which spans between 100 and 230 degrees. Furthermore, VonShef’s mini oven features an integrated double plate with a small (600W) hob and a larger one (1000W). The oven and the hobs can be used simultaneously, which will allow you to cook several dishes at the same time. One of the best things about VonShef’s mini oven is that it features a massive capacity of 36 liters: it’s great for caravans, offices, camps, homes, and practically any situation which demands reliable cooking elements, but that’s not all. Even though you could stuff a larger chicken in the oven, it can still pass for a compact oven. It’s petite size is just one of the reasons why this is our choice as the best mini oven. There are several convenience features among the basic ones, including a wire grill rack, a backing tray, and a tray handle. Of course, you’d normally have to purchase these features standalone, but this model provides them completely free of charge. Now that we’ve stated the most notable features of VonShef’s 36L mini oven, let’s talk a bit about what you may like and dislike about it. What we really liked about this mini oven is it’s functionality and practicality. Namely, all of the features are remarkably easy to use, despite the fact that they’re numerous and quite advanced. The oven is huge by mini oven standards, but it’s still small enough to keep the “mini” attribute. What’s more, the hobs are strong, boasting 600W and 1000W respectively. The only thing you might not like so much about VonShef’s mini oven is the price, namely, this outstanding mini oven belongs in the “high” price point category, as it costs quite a lot. Regardless, it offers massive value for money and we highly recommend that you give it a shot if you’re looking for the best value oven. All things considered, this mini oven is a big, versatile, powerful mini oven which, alas, comes at quite a price. We’re calling it the “best mini oven overall” because it’s equally good for professional chefs and people who simply want to get their meal done in a simple fashion. Superb value for the money: VonShef’s mini oven is one of the best mini ovens on the market. Highly versatile: outfitted with six cooking functions and a plethora of convenient features, this mini oven boasts a huge level of versatility and functionality. Huge capacity: this mini oven features 36 litres of capacity. Easy to use and easy to clean: VonShef’s mini oven is, despite it’s big capacity, very practical and compact. Quite expensive: VonShef’s Mini oven belongs to the medium bracket of the “high” price point category. Our first runner up is Andrew James’ Halogen mini oven, a beautiful, modern mini oven which comes outfitted with numerous exquisite features and settings. In a nutshell, the Andrew James; Halogen mini oven boasts 12 litres of capacity, an adjustable temperature button, a halogen accessories pack, extender ring and a replacement bulb. It’s very versatile, doesn’t cost too much, and we’re here to show you the full extent of its power, so let’s get straight to it. First of all, let’s talk about Andrew James’ Halogen mini oven’s capacity. We’ve already mentioned that it features a 12l capacity, but is it enough or too little? When compared to VanShef’s mini oven (our best mini oven overall), the tank of this model is exactly three times smaller. It’s just big enough for you to cook, bake, fry, steam, or grill your meals, but the real benefit of this oven isn’t its size, it’s the convenience it offers. Primarily, the halogen bowl is removable, which means that it’s superbly easy to clean and maintain. The temperature control button is very easy to use and it’s quite powerful too. It boasts a power level of 1400 Watts which can reach up to 250 degrees very quickly. On top of that, there’s a sixty minute timer that you can use as a reminder. The next feature worth highlighting is the halogen oven accessories pack: it comprises a high grill rack, a low grill rack, a backing tray, a steamer tray, a set of tongs, and four metal skewers. You can consider these as complementary (bonus) features much akin to those that VonShef provided with their own micro oven. There are two more bonus accessories included which aren’t a part of the “accessories pack” – the extender ring and the replacement bulb. The extender ring is, basically, an upgrade to the oven’s bowl, providing a bonus of five liters to the 12l capacity (giving a total of 17l with the ring). Let’s also say a word or two about the design of Andrew James’ Halogen mini oven. When compared to VonShef’s mini oven it’s smaller and, obviously, takes up much less space. Furthermore, it’s easier to use and transport, as well as easier to clean due to the removable bowl. It comes in two color variations, including the black and white color option. Even though aesthetics are of little concern here, Andrew James’ Halogen mini oven is one of the best looking in our reviews. There are plenty of things you’ll like about this mini oven. It’s petite in size, very easy to use, looks awesome, and it’s among the most versatile mini ovens available on the market. What’s more, it doesn’t cost too much either, belonging in the “medium” price point category and holds quite a value for the buck. However, we thought that certain things about it could be a bit better. Firstly, the mediocre storage capacity means that you won’t be able to prepare certain full course meals. This issue is, however, resolved with the extender ring which provides a bonus of 5 litres to the overall capacity. The second problem is, ironically, the cleaning part. Even though the bowl is very easy to clean, the base and the bulb aren’t. There are numerous fragile and delicate pieces here, so you should pay extra attention when cleaning them. Lastly, the lid is a bit too cumbersome, so you might think that the entire bowl is unstable at times (which will just make you feel uneasy, rest assured that it is as stable as can be). All things considered though, this is a marvelous mini oven from a reputable brand and we highly recommend that you try it out. It does have several minor flaws with its design as mentioned, but none of them are substantial and do not impede the performance of the oven itself. Excels in aesthetics: Andrew Jones Halogen mini oven looks plain awesome and comes available in two color variations. Excellent temperature control: this oven, though small, can reach up to 250 degrees via 1400W heating element. Bonus accessories pack: you’ll get a high grill rack, a low grill rack, a baking tray, a steamer tray, a set of tongs, and four metal skewers. Great value: ideal for both beginner cooks and seasoned chefs. Cumbersome lid: a small flaw that doesn’t actually affect the performance of this oven. Certain parts are hard to clean: the bulb and the base are harder to clean than the glass bowl. Next up is Tower’s T14012 Mini oven – a plain looking oven with a huge storage, compact design, and a set of handy little features. First of all, the T14012 is a combo of oven and grill, but when compared to VonShef’s mini oven, it lacks the hot plates on top. Everything else is there though: you can cook, bake, roast, and fry your meals. This mini oven is available in 23, 28, 33, and 42 litre options, although there are no color variations, so you’ll have to settle for the all-black design. Speaking of design, this is a plain, compact oven. It’s ideal for student accomodations, small kitchens, and for people who want to cook their food on travels. The temperature range spans from 90 and 230 degrees, allowing you to cook your dishes on small, medium, and high temperature settings. There’s also a 60 minute timer which will help you organize the timing of your dishes, but virtually all ovens we’ve reviewed so far come with this feature. 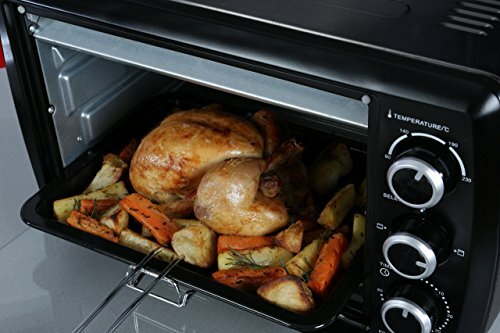 Tower’s T14012 Mini oven comes outfitted with a baking tray, a wire rack, and a tray handle. These bonus features are as plain as the oven itself, but they’re completely free, which is quite awesome. The 23L capacity is less than what VonShef’s oven offers but more than the Andrew Jones oven will give you – it’s the “golden middle” for both professional chefs and casual cooks. Apart there is lots to like about Tower’s T14012 Mini oven, there are a few things we thought could be improved. For instance, this mini oven takes quite a lot of time to heat up, mainly because it features a big storage. On top of that, the T14012 is just a bit more expensive than Andrew Jones mini oven. That said it does, however, belong to the same price point category. Overall, Tower’s T14012 Mini oven is convenient, very plain, compact, and reasonably powerful. There are no outstanding features which would make it exquisite per se, but that’s exactly what makes it so good for casual chefs and cooks. Plain and compact design – Tower’s T14012 Mini oven is very easy to use and it’s as compact as can be. Decently big storage – this mini oven comes outfitted with a 23 litre “tank”. Gratis features – if you opt for Tower’s T14012 Mini oven, you’ll get a baking tray, a wire rack, and a tray handle as complementary features. Great value for the buck – despite being pricey, this oven offers huge value for the cash. Slow warm up – this mini oven requires quite a lot of time before it can begin cooking. Relatively pricey – Tower’s T14012 Mini oven belongs to the medium bracket of the “medium” price point category. The Cooks Professional black mini oven is as plain as Tower’s T14012 Mini oven, but it comes with a different set of features and a somewhat more affordable price. Let’s be frank – both of these mini ovens are great, but we know that different people have different needs, so for the sake of diversity, we’ve decided to bring another runner-up to the table. This is, essentially, a table top mini oven with a 20-litre capacity. That’s just three liters less than Tower’s T14012 mini oven. There are three cooking functions, including the grill, bake, and “combination” which mixes the aforementioned two. The temperature range spans from 100 to 230 degrees, making cooking on lower temperatures a bit difficult, but doable. A 60-minute timer is included, as well as a 1-year guarantee. We really liked the simplicity of the design of the Cooks Professional mini oven. This is a compact, nearly portable oven which is great for both casual and professional chefs. The additional accessories include a baking tray, wire rack, and a detachable handle. The price is pretty cool too – this oven is in the same price range as our previous pick (Tower’s mini oven), and it also holds a great value for the money. 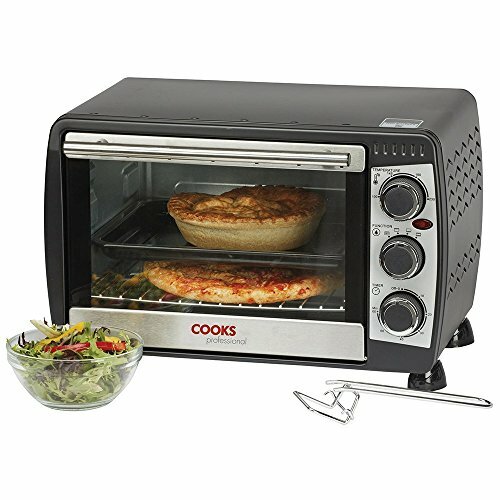 Plain and simple – The Cooks Professional’ mini oven is very easy to use. Quick warm up – you can rest assured that you’ll prepare your dishes quite fast with this mini oven. Compact and portable – you can take your Cooks Professional’ mini oven with you on your travels due to its compact design. Comes with bonus features – if you choose this mini oven, you’ll get a baking tray, a wire rack, and a detachable handle for free. You might need some time to get accustomed to it. If you’re looking for a low-budget mini oven, Quest’s oven is the perfect choice. In essence, this is a petite, yet decently powerful mini oven which is as compact as it is energy efficient. It features a 9L storage, a 60 minute timer, and 1000 Watts of power. 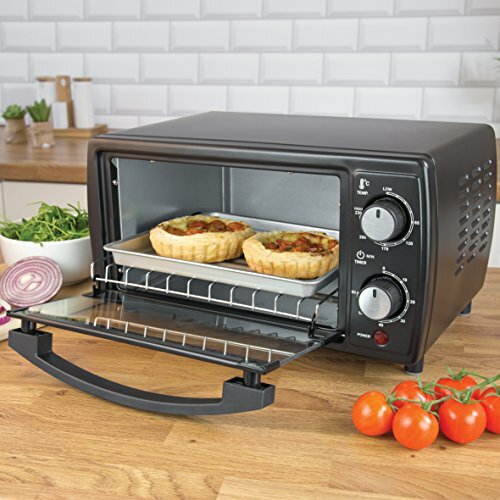 What’s really great about this mini oven is that it features a temperature range which spans from 65 to 230 degrees – it’s absolutely ideal for cooking dishes on a slow fire, but preparing express meals won’t be an issue. With 1000W of power, you can rest assured that you will be able to prepare full course meals with ease. The heat settings are very easy to use – in fact, the entire oven is as plain as can be. The best thing about Quest’s mini oven is that it comes at a very low price. It belongs to the medium bracket of the “affordable” price point category, and this is the best mini oven you could get within the price range. The only bad thing about it is that it’s very, very small, so you might have troubles with certain meals. 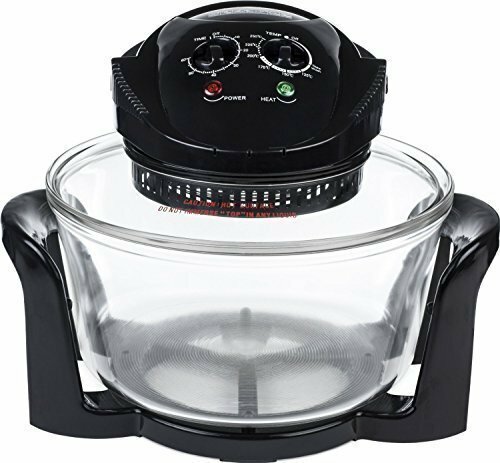 Superb price – this is one of the cheapest high-quality mini ovens out there. Strong – Quest’s mini oven features 1000w of power. Compact and portable – this mini oven is among the smallest, as well as the cheapest ovens on the market. Ideal for beginner cooks – if you need some time to save up for a better oven, this one’s perfect for you. This concludes our review of the best mini ovens on the UK market. Our top pick is VonShef’s mini oven which surpasses all other models in terms of power, versatility, and value for the price, but that doesn’t mean that our other picks aren’t good. In fact, each model in our review is excellent in it’s own terms, so just decide your budget, kick back, relax, and take your pick.